Orlando, a name synonymous with fun-filled vacations, is home to over a dozen theme parks. The most celebrated among these is the Walt Disney World, containing the much-loved Magic Kingdom and Epcot. Vying for attention a few miles away is Universal Orlando, housing Universal Studios, Islands of Adventure, and the Wizarding World of Harry Potter. But Orlando isn’t just about adventure-packed theme parks fantasy worlds. There’s a quieter side to this central Florida city, featuring sprawling greens punctuated by lakes, and tree lined neighborhoods waiting to be explored. There’s a fantastic gastronomic trail to be discovered here as well, in addition to a thriving performing arts scene. For an Orlando holiday that lets you explore the many tints and shades of this fabulous city, choose from our list of best Orlando hotels below. A slick new extension to the award winning Disney’s Contemporary Resort, Bay Lake Tower represents a stylish amalgam of plush comfort and modern elegance. 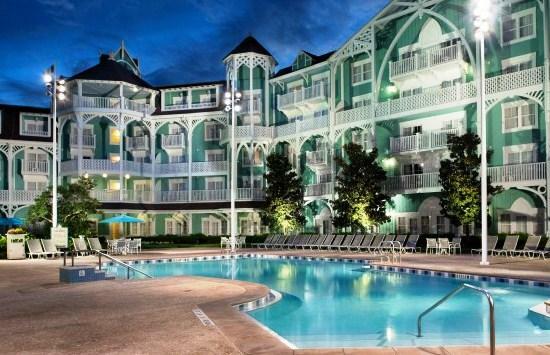 Offering a lakeside setting within walking distance of Magic Kingdom Park, the hotel offers spacious studio suites featuring cheerful color palettes, kitchenettes, sitting areas and flat screen TVs. Larger ‘villas’ have separate living rooms, 1-2 bedrooms, and fully functional kitchens. 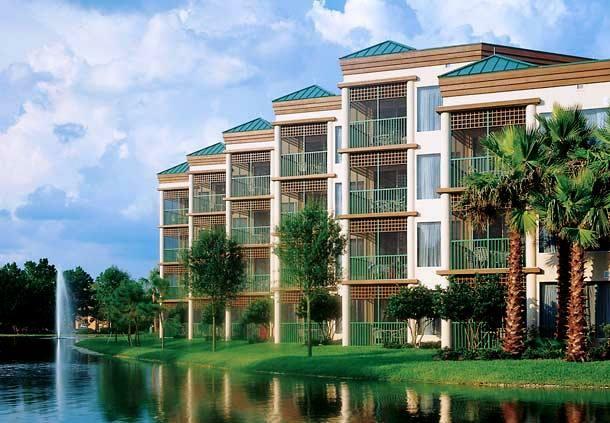 All suites and villas at Bay Lake Tower have floor-to-ceiling windows offering grand views of Bay Lake, Cinderella Castle, or verdant gardens with cypress trees. 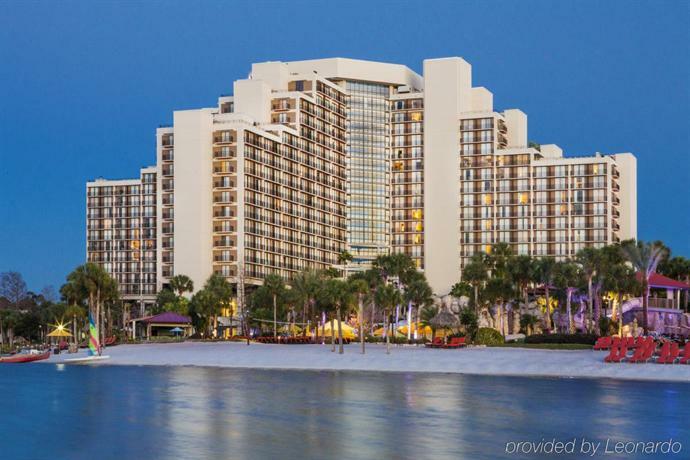 There’s no dearth of recreation facilities here – from the exclusive Bay Cove plunge pool, to the Resort Monorail to take you to Magic Kingdom and Epcot, to the perks of the adjoining Disney’s Contemporary Resort. After a long day of fun, guests can unwind at the hotel spa, or step into California Grill or any of the other theme restaurants for a bite. Room service is available 24/7, and the management can even organize in-room celebrations for your loved ones. 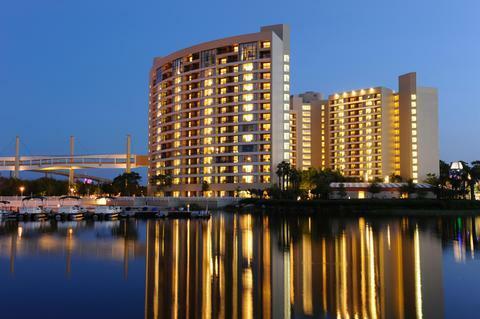 Disney Vacation Club members can enjoy exclusive discounts on all room and service tariffs at Bay Lake Tower. A popular choice among families holidaying in Orlando, Disney’s Beach Club Villas are located right next to Epcot, a short boat ride from Disney’s Hollywood Studios, and a few minutes’ drive from Magic Kingdom. This beach-themed property features New England style accommodation, punctuated by landscaped gardens, pools, water parks, spas, and myriad amenities brought to you by Disney’s Yacht & Beach Club Resorts. On offer here are spacious studios, and ‘villas’ ranging in size from 1- to 2-bedroom units. All feature hardwood floors, private balconies, chic furnishings, flat screen TVs, coffeemakers, safes, microwaves and minibars. Villas have their own, fully-functional kitchens and separate living areas. All suites offer views of the Beach Club Resort, landscaped gardens, waterparks, pools or courtyards. A beautifully designed 3-acre water park within the property features a life-size shipwreck, and multiple pools and lagoons. Guests travelling with kids can check out the Sandcastle Club that organizes supervised activities for little ones, leaving their parents free to enjoy an evening out. From guided fishing tours, to boat and bike rentals, to jogging tracks, tennis courts and a miniature golf-course, to movie screenings under the stars, there’s more than enough fun to go around here to keep the entire family busy. Once you’ve worked up an appetite, head to Cape May Café, Yachtsman Steakhouse, or any of the other lounges and grilles on the property. 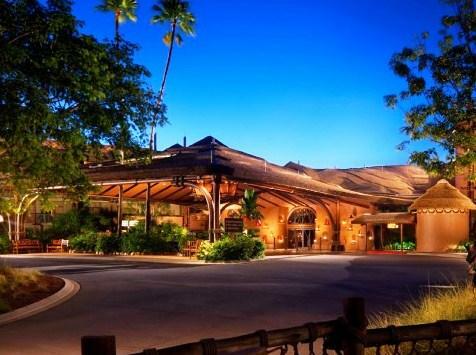 Escape to an African safari-themed fantasy world on your next Orlando getaway. Disney’s Animal Kingdom Villas, Kidani Village, is located just under 2 miles from Animal Kingdom. The villas are laid out in a sweeping horseshoe plan amid landscaped gardens, a spa and a health club, offering uninterrupted views of lush greenery and a wide range of hoofed animals and birds. The building is styled in the spirit of the traditional African kraal, with sloped roofs and fence-like timber treatments on the external façade. The interiors of the studio suites and villas echo the same African inspiration, via bold prints, woven lampshades, and carved wooden elements. There’s free Wi-Fi in all the suites, along with pull-out sofas, coffeemakers and microwaves. 1- and 2-bedroom villas have separate living rooms, private balconies, fully functional kitchens, and grand views of the savannas outside. Recreation facilities at Disney’s Animal Kingdom Villas include a heated tropical themed pool and water playground, the atmospheric Sanaa restaurant with its delectable menu and savanna views, an activity center for children, a full-service fitness center, a video game arcade, and sundry indoor and outdoor sports facilities. Disney movies are screened under the stars by the pool, and in-room celebrations are organized by the management upon request. Don’t just visit Orlando for the theme parks; turn your trip into a luxurious family vacation at Marriott’s Imperial Palms Villas, located just off Lake Bryan, across Interstate 4 from Epcot and the myriad Disney theme parks in the city. There are 46 sprawling air conditioned villas to choose from, each with 3 bedrooms and 2 bathrooms. Accommodating up to 10 guests each, the villas are tastefully decorated and equipped with rich wooden furniture, large private balconies, fully functional kitchens, laundry facilities, multiple TVs with DVD players, and free Wi-Fi. Bathrooms have separate tubs and showers, and twin vanities. The luxury property comes with a full-service fitness center, sports courts, a heated swimming pool, a separate kiddie pool, along with a jungle gym and play area for tiny tots. Snacks and sundries are available in the well-stocked MarketPlace Express on the property, which also dispenses Starbucks Coffee. Parking is complimentary. Guests can also enjoy access to the restaurants, bars, lounges, golf course and souvenir shops of the adjoining Orlando World Center Marriott resort & convention center. A full-service luxury resort in the heart of Orlando, Marriott’s Royal Palms is about 3 miles from Disney’s Typhoon Lagoon, 4.5 miles from Epcot, and just over 10 miles from Universal Orlando. Designed as a verdant oasis surrounded by palm trees, the hotel offers villa-style accommodation detailed to the highest standards of luxury. The spacious 2-bedroom, 2-bathroom villas feature plush furniture, ample daylight, private balconies or patios, luxurious master suites with oversized soaking tubs, fully functional kitchens with breakfast bars overlooking large living/dining areas, and multiple televisions fitted with DVD players. Wi-Fi is free, and washer/dryers, refrigerators, ironing boards, microwaves, and the complete range of cookware and tableware ensure that you’re right at home in your villa. Each villa can accommodate up to 6 guests. A fitness center on the property features complete gym facilities, a heated outdoor pool, a sauna, and multipurpose courts. 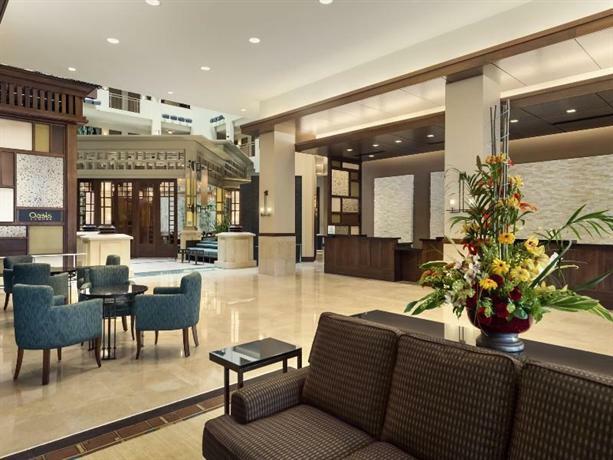 A MarketPlace Express offers snacks, sundries and Starbucks Coffee, and a host of dining and entertainment options await you at the neighboring Orlando World Center Marriot hotel. 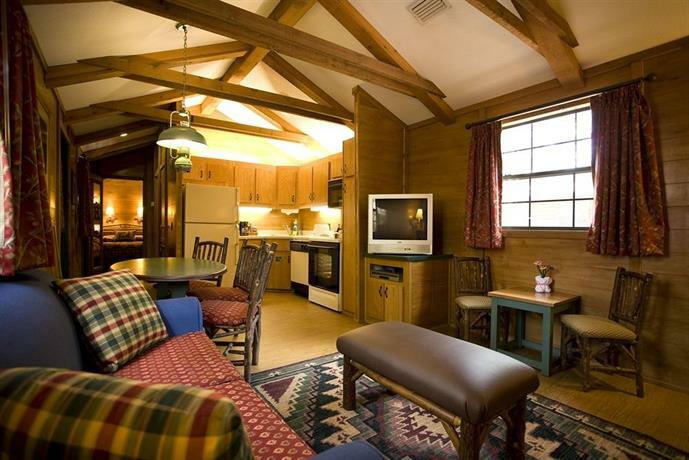 Disney’s Fort Wilderness Resort is a tree-lined treat spread over 750 acres, just over 3 miles from Disney’s Magnolia Golf Course, and 4.3 miles from Walt Disney World Resort. Modeled along the lines of the American frontier, the resort lets you rent a cabin or set up camp in its gorgeous pine and cypress covered expanse, and share space with deer, rabbits, armadillos and ducks. The rustic cabins on offer here give you a taste of the pioneer’s life, without taking away any of the comforts you’re used to at home. They have bunk beds, pull-out sofas, fully functional kitchens and picnic tables. To help you settle in comfortably, the management can stock up your cabin with groceries of your choice before you arrive. Recreation facilities on site include a fort-themed water park for kids, a quiet wilderness pool, a whirlpool spa, and Wild West themed shows organized in the campground hall. 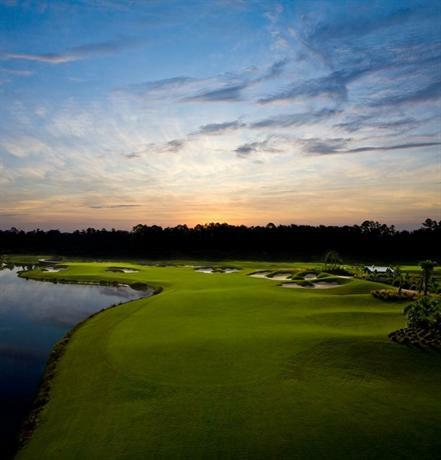 A luxurious property set amid the sprawling greens of Grand Cypress Golf Resort, the Villas of Grand Cypress offer a world of luxury and serenity, just 3 miles from Walt Disney World. Accommodation here takes the shape of spacious, airy suites and villas featuring contemporary décor, private patios, and unbeatable views of the 1500 acre golf course. Villas range in size from 1- to 4-bedroom outfits, complete with their own kitchens, separate living areas, and the full range of home appliances. Services here are impeccable, including the likes of in-room spa treatments and babysitting. Guests can prepare their own meals, or dine at the resort restaurant. A bar flanks the outdoor pool. The grounds around the villas also offer cycling trails, a golf school, tennis courts, a gym and a sauna. A sophisticated lakefront hotel just a mile away from Walt Disney World Resort, Hyatt Regency Grand Cypress combines convenience and luxury to make for a perfect Orlando holiday. As many as 815 guest rooms offer lovely garden, lake and pool views. 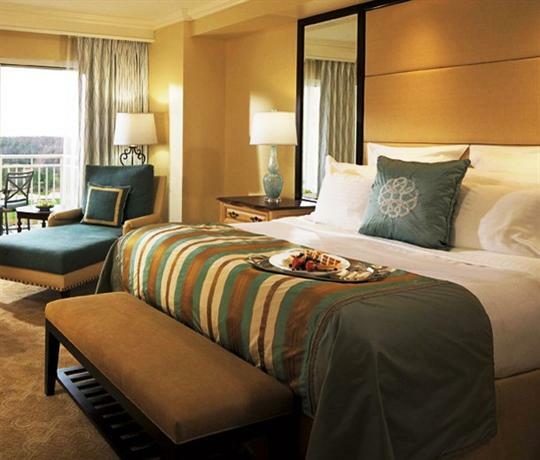 Upgraded rooms have their own balconies, and some provide exclusive access to the hotel’s concierge club. Suites have separate living rooms, large patios and Keurig coffeemakers. There is a range of dining options to choose from, along with large event spaces and golf courses. A small fee will fetch you access to a theme park shuttle, a 24-hour gym, and a pool complex with waterslides. 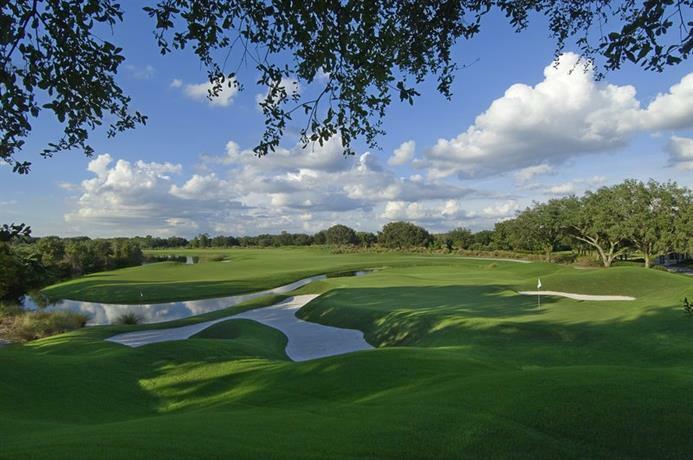 A tranquil oasis that doubles up as a luxury golf resort, Waldorf Astoria Orlando also happens to be neighbors with the Walt Disney World Resort. In addition to this, it gives you easy access (via free shuttle service) to Epcot and Magic Kingdom, both about 5 miles away. The stately hotel building houses refined guestrooms and suites, finished in soft earth tones, and equipped with Egyptian cotton linens, Italian marble bathrooms, and lovely views of the golf greens. In addition to the golf course, the outdoors have 2 swimming pools with private cabanas. Other amenities include a fitness center, a spa, a driving range, a sprawling business center, and myriad dining options. Set in 500 acres of lush tropical greens, the Ritz-Carlton Orlando lets you enjoy a quiet, luxurious vacation, away from the action and hubbub of the city’s theme parks. The design of the hotel building draws its inspiration from Italian palazzos, which is also reflected in the elegant interiors of its 582 rooms and suites. Choose the suites for their extra space, lake views and soaking tubs, and club rooms for exclusive access to complimentary food, drinks and internet at the hotel’s club lounge. Ritz-Carlton Orlando has 11 restaurants that cover every variety of cuisine, plus a luxe spa, 3 outdoor pools, a golf course, sprawling event spaces, and a variety of eco-tourism experiences. For those who can tear themselves away from the verdant bliss of this Grande Lakes property, the management offers shuttle service to most Orlando theme parks and destinations. Indulge yourself in creature comforts at the Lighthouse Key Resort and Spa, a serene lakeside complex barely minutes away from Walt Disney World. Elegant, classically appointed 2-, 3- and 4-bedroom condos overlook Lake Raccoon and landscaped gardens. Fully furnished and opening onto private patios, they feature separate living rooms, functional kitchens, bathrooms with bathtubs and showers, TVs in all bedrooms, and free Wi-Fi throughout. Facilities for guests include access to a fitness center and a day spa, along with a heated outdoor pool and Jacuzzi. The resort provides free shuttle service to all major theme parks in the vicinity. 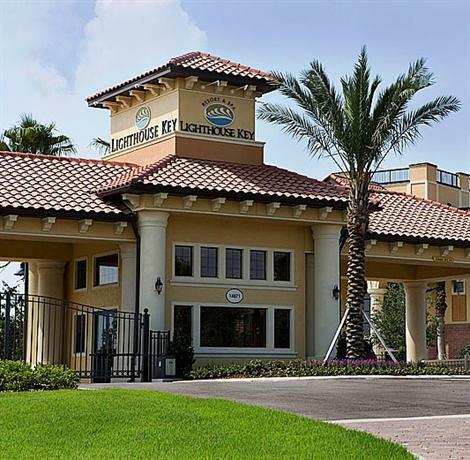 Set in 270 acres of golf greens and beautifully landscaped property, Arnold Palmer’s Bay Hill Lodge is part of the golf club by the same name. 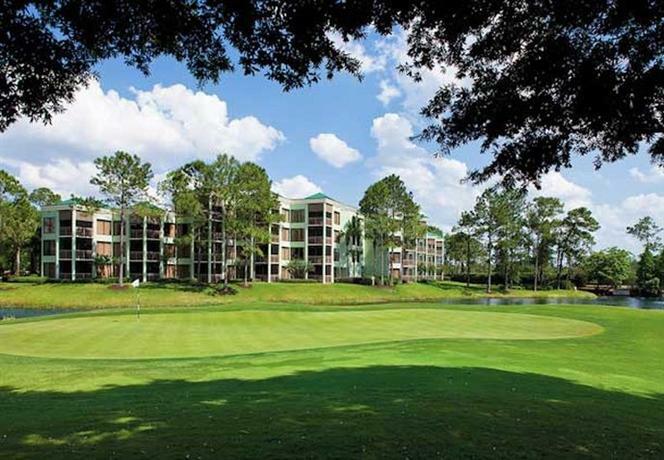 A short drive away from Walt Disney World and Universal Studios, the 4-star resort-style facility is popular among golf enthusiasts and holidaying families alike. 70 air conditioned rooms overlook the verdant property, and have private balconies, Egyptian cotton linens, flat screen TVs, free Wi-Fi, and elegant bathrooms with soaking tubs and designer toiletries. In addition to room service, there 3 restaurants on the premises, including the popular Grill and Classic. Guests can also spend time at the cozy Members’ Lounge, work out at the on-site gym, enjoy massages and treatments at the club spa or in their rooms, or a few laps at the swimming pool. Designed to cater to business travelers, Rosen Shingle Creek Resort can serve holidaying families just as well. Set in a 230-acre expanse of gardens and water bodies, the resort is about 3 miles from Orange County Convention Center and SeaWorld Orlando, and about 7 miles from Universal Studios and the airport. The Spanish-Revival themed building houses luxurious rooms and suites with garden, pool or golf course views. They have free Wi-Fi, large safes, flat screen TVs, coffeemakers and minibars. Besides golf privileges, guests at Rosen Shingle Creek Resort enjoy access to the property’s fitness center, hot tubs, luxe day spa, tennis and basketball courts, and myriad dining options. A sprawling business center with large meeting spaces is also available. A slick contemporary hotel in Orlando North, the Westin Lake Mary is a short drive away from the Central Florida Zoo and Botanical Gardens. The immediate neighborhood has a host of shopping and dining options. The hotel offers a mix of regular and club rooms, the latter offering exclusive access to complimentary continental breakfasts and evening snacks at the club lounge. All rooms can accommodate up to 4 people, and feature soothing color palettes, Westin signature beds, flat screen TVs, ergonomic work stations and free Wi-Fi. A grill restaurant, a bar, a fitness center, an outdoor pool, and spacious meeting rooms, are also part of the hotel. 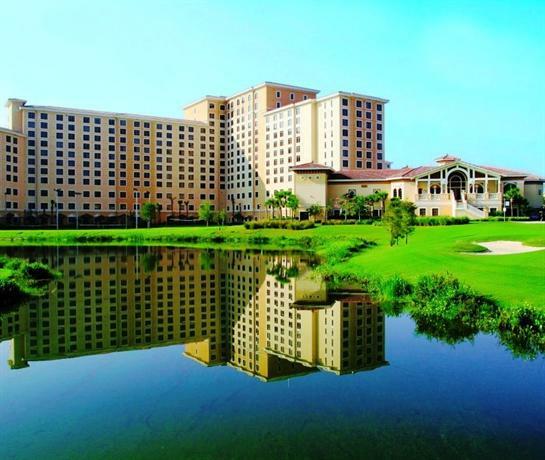 Well connected to Orlando International Airport and Walt Disney World, Embassy Suites operate under the Hilton banner in Kissimmee. This all-suite hotel offers plush 1-bedroom units with separate living areas, microwaves, refrigerators, safes, and 2 TVs. Guests can enjoy complimentary made-to-order breakfast and evening receptions. 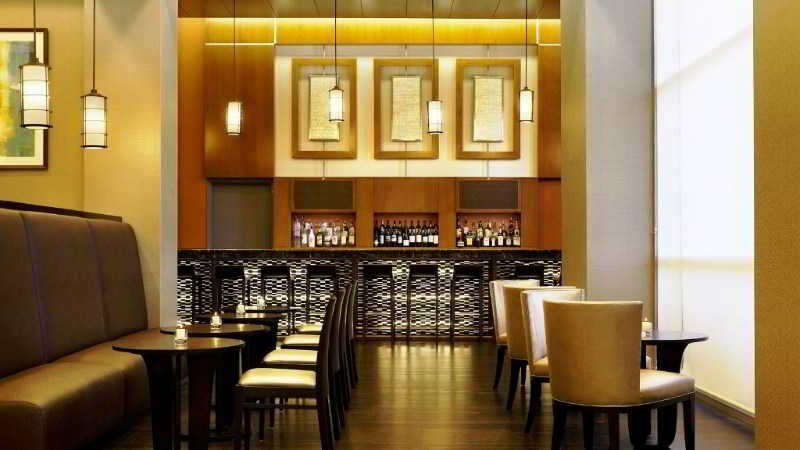 The property has a chic bistro-style restaurant, a lobby lounge, a coffee shop, and a MarketPlace outlet. Extensive facilities for meetings and conferences are also available at the Embassy Suites, in addition to an outdoor pool and hot tub.